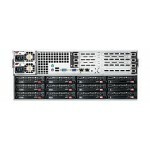 High Efficiency Power & High Storage Capacity High-Availability Features: Redundant, Hot-pluggable cooling system, Power Supplies, Hot-swap drives. 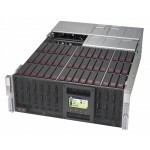 Extreme High Density and High Capacity Storage Chassis support 60 x 3.5" Top Loading SAS/SATA 12Gb/s Hot Swapping HHD/SSD Bays, Tool-less HDD tray with HDD LED indicator, Single Expander Backplane Boards support SAS3/2 HDDs with 12Gb/s throughput, 4 x Mini-SAS HD ports for Internal / External Cascading Expander Combination for high performance, high availability or high redundancy requirements , Ideal for Cloud backup, data Replication or High density Archive Storage Applications. 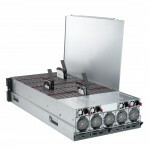 Extreme High Density and High Capacity Storage Chassis support 60 x 3.5" Top Loading SAS/SATA 12Gb/s Hot Swapping HHD/SSD Bays , Tool-less HDD tray with HDD LED indicator, Dual Expander Backplane Boards support SAS3/2 HDDs with 12Gb/s throughput , 8 x Mini-SAS HD ports for Internal / External Cascading Expander Combination for high performance, high availability or high redundancy requirements , Ideal for Cloud backup, data Replication or High density Archive Storage Applications. 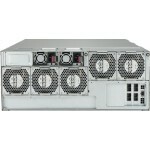 44x (24 front + 20 rear) 3.5" hot-swap SAS/SATA drive bays supporting SAS3/2 or SATA3 HDDs with 12Gbps throughput , Redundant 1280W Platinum Level (1+1) power supplies with PMBus, 7x 8cm (middle) hot-swap redundant cooling fans, Palletized packaging for easy shipping and handling. 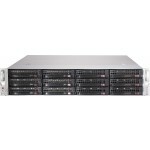 4U High Density Storage JBOD Chassis with capacity 90 x 3.5" hot-swappable HDDs in 45 drive bays, Dual Expander Boards and Front/Rear Backplane Boards support SAS3/2 or SATA3 HDDs with 12Gb/s throughput , 8 x Mini-SAS HD ports for Internal / External Cascading Expander Combination for high performance, high availability or high redundancy requirements , Ideal for Cloud backup, data Replication or High desnsity Archive Storage Applications. 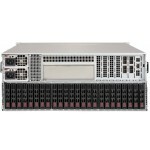 4U High Density Storage JBOD Chassis with capacity 90 x 3.5" hot-swappable HDDs in 45 drive bays , Single Expander Board and Front/Rear Backplane Boards support SAS3/2 or SATA3 HDDs with 12Gb/s throughput, 4 x Mini-SAS HD ports for Internal / External Cascading Expander Combination for high performance, high availability or high redundancy requirements, Ideal for Cloud backup, data Replication or High desnsity Archive Storage Applications. 4U Storage JBOD Chassis with capacity 24 x 3.5" hot-swappable HDDs bays, Dual Expander Backplane Boards support SAS3/2 HDDs with 12Gb/s throughput, 8 x Mini-SAS HD ports for Internal / External Cascading Expander Combination for high performance, high availability or high redundancy requirements ,Ideal for Cloud backup, data Replication or High desnsity Archive Storage Applications. 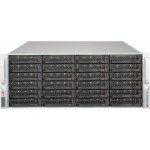 4U Storage JBOD Chassis with capacity 24 x 3.5" hot-swappable HDDs bays, Single Expander Backplane Boards support SAS3/2 HDDs with 12Gb/s throughput, 4 x Mini-SAS HD ports for Internal / External Cascading Expander Combination for high performance, high availability or high redundancy requirements, 5 hot-plug redundant cooling fans. 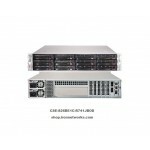 CSE-826BE1C-R741JBOD 2U Storage JBOD Chassis with capacity 12 x 3.5" hot-swappable HDDs bays, Single Expander Backplane Boards support SAS3/2 or SATA3 HDDs with 12Gb/s throughput, 4 x Mini-SAS HD ports for Internal / External Cascading Expander Combination for high performance, high availability or high redundancy requirements,Ideal for Cloud backup, data Replication or High desnsity Archive Storage Applications. 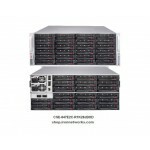 In order to reach better quality, this product was recommend to be sold as complete system with HDDs and tested before ship.Please contact us, +(1) 408-895-5000 x 1, shop@ironnetworks.com sales rep for validated HDD. 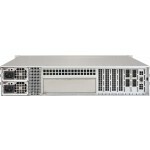 Extremely high-density 4U storage server chassis (saves 2U space), Maximum drives per enclosure: 72x (48 front + 24 rear) 2.5" hot-swap HDD bays for server chassis, . 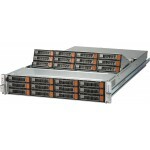 E2C: SAS3 (12Gbps) dual expander backplanes, 1200W Titanium Level (1+1) redundant power supplies with PMBus, Optimized thermal solution with 100% redundant cooling design.